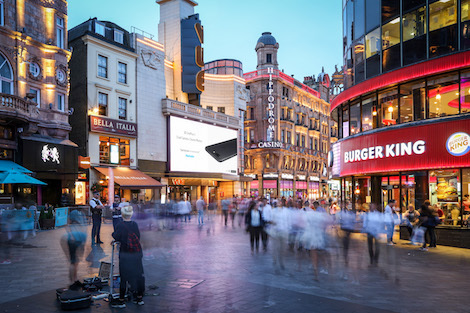 Premium out of home media owner Ocean has unveiled a new digital screen in the heart of London’s West End, Leicester Square. Located in the centre of London’s entertainment district, the screen forms part of a GBP 6.6 million investment in the Vue cinema, which has a big screen entertainment heritage dating back to 1938. The Screen on Leicester Square launches with One Plus as its advertising partner. OnePlus’s campaign was planned through Starcom and runs for two weeks. 12.4m wide x 5.2m high (62.7 square metres), it will deliver advertisers 3.5 million impacts per fortnight. This entry was posted on Friday, July 21st, 2017 at 08:27 @394 and is filed under DailyDOOH Update. You can follow any responses to this entry through the RSS 2.0 feed. You can leave a response, or trackback from your own site.